Old Company Stock Research Service is the successor to the archives, publishing rights and copyrights on obsolete research reference material published by the RM Smythe, Marvyn Scudders Manuals, the Robert D. Fisher Manuals, and the Herzog & Co., Inc. obsolete research services, which have performed expert old stock research services continuously since 1880. Have you found an old certificate and you don’t know what it’s worth? Scripophily.com Old Company Research is the World’s #1 Stock & Bond Research Firm. We’ll help you find information on your stock and bond certificates and then tell you how to redeem them. 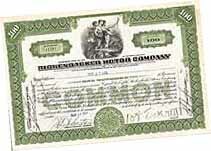 We also appraise, buy and sell collectible stock and bond certificates. Companies whose original identities have been lost due to a change in name, merger, acquisition, dissolution, reorganization, bankruptcy or charter cancellation. We research companies from all over the world. The resources used in determining your research report includes our large proprietary library of old company stock and bond research performed during the past 138 years which includes information from the Marvyn Scudders Manuals, the Robert D. Fisher Manuals, and the Herzog & Co., Inc’s obsolete research service reports, and other reliable sources. Our company is the world’s leading provider of Old Stock and Bond Research Services and we are the successor to all material published by the Marvyn Scudders Manuals, the Robert D. Fisher Manuals, and Herzog & Co., Inc. obsolete research services, which have been performed continuously since 1880. When we receive an inquiry about a particular company or issue, our research professionals turn to Scripophily.com Old Company Research’s extensive records. Every inquiry generates a produced report detailing the company’s history regarding name changes, mergers, bankruptcies, predecessor and successor companies. If the company did survive, we will provide you contact information so you can determine whether your securities have market value today and how you can realize it. 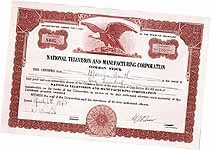 If your certificates have no value as redeemable securities, we may be interested in purchasing them as a collectible. Our clients are attorneys, corporations, institutions, brokers, executors, trustees, CPA’s, banks executors, and individual stock and bond certificate holders worldwide. To order the company research service, please fill in the following information for the company you would like researched and click on the"Add to My Shopping Cart" button down below. For more than one company to be researched, simply return hit the + sign Add another company below and follow the same process for the next company. Please note that you are not charged for shipping when we send your research findings by email. Please select "Research Old Stocks Email" as your shipping method in the scroll down menu when you are checking out. The minimum information we need to start the process is the company name, state of incorporation, and the date the certificate was issued. Once you complete the information form, please click on "Add to shopping cart". If you have more than one company to research, please click on [ + ] Add another company above and another template will appear for another company's information. If you would rather order by mail or fax, or you can print out our Mail and Fax Order Form by Clicking Here to send us the information. If you have any questions, please call our toll free number at 1-888-STOCKS6 ( 1-888-786-2576 ) or dial direct to 703-787-3552 or send us an email to Old Company Research .